Doing Good Together - Special Event! Join this special DGT Boston kick-off event and learn about Cradles to Crayons' mission while you warm your kids up to the idea of giving back with fun and thoughtful activities! Wear your pj's (kids and adults!) and bring at least one pair (if not many more) to donate to Cradles to Crayons. Last year's total drive supplied Cradles to Crayons with thousands of new pajamas that kept local kids safe and warm throughout the year. Your participation will help them fill this need again. Can't make it on February 3? You can still donate pj's to our drive! Just contact Kira@doinggoodtogether.org to make arrangements to deliver your donations. Contact: Email Kira@doinggoodtogether.org to register or for more information. Preregistration is required. There are only eight spaces left so register today! Location: Boston (Boston Cares provides address when you register.) T-Accessible: Red Line (South Station), Blue Line (Aquarium), and Orange Line (State Street). Boston Cares offers a new goCreate project one Sunday a month. It is a chance for kids to get crafty while making an impact. Each month's project will meet a community need and the completed goods will be donated to local agencies to fulfill that need. In February, volunteers will be creating Valentine's Day cards for veterans at the New England Center for Homeless Veterans. Please note that Boston Cares requests a suggested donation of $5.00 per participating volunteer in order to help them provide supplies and management of the goCreate project. Thank you in advance for your donation. Ages: This project is intended for families and young volunteers. Children five and older are welcome to participate. All volunteers under 13 years old must be accompanied by an adult over 18 years old. In order to attend, you must be either under the age of 18, or accompanying a child. Contact: Ginelle Testa, generationOn Coordinator, Boston Cares, gtesta@bostoncares.org, 617.422.0910, Ext. 208 or email Ginelle at youth@bostoncares.org for applications and more information. This project is reserved for Boston Cares members who have attended an orientation. All volunteers under 18 years old must bring a permission form signed by a parent or guardian to give to the Project Leader. Community Cooks is a nonprofit that mobilizes hundreds of volunteers who make home-cooked meals for hungry and vulnerable neighbors in their community. For nearly 25 years, they've been bringing their home-cooked meals to people in shelters, low-income families and seniors, at-risk women and kids, veterans, and so many others who are struggling. Volunteer Cooks are assigned to a team to cook for a specific agency in their area. Once a month cooks make a specific course of a meal (main course, veggies/salad, dessert, etc.) in their own homes and deliver it to a designated drop-off location. A recipe and ingredients from the grocery store to make your assigned dish. A kitchen to make it in - with a stove, oven, fridge, cookware, etc. Transportation so you can deliver your food once it's made. Also, donations of small bottles of shampoo, conditioner, soaps, wash cloths, deodorant, toothbrushes and toothpaste, body lotions, shaving cream and any other personal care items are much appreciated. The Wish Project's mission is to provide our local people in need with basic furniture, home and baby goods while we help the planet by recycling used goods. Only when people have their basic needs met can they move forward and out of the social services system. By providing basic goods to people in crisis, we help end needless suffering in the short term while helping to end homelessness in the long term. The Wish Project is looking for groups or individuals to help at their warehouse. Some of the tasks volunteers can help with in the warehouse are sorting and putting away clothes, linens, home goods and furniture. Discover the community issues behind the Boston Cares service projects and learn about how you can make a bigger impact in your community through Boston Care's February's Learn & Serve (formerly Teen TeamWorks). This program offers youth aged 13-18 the opportunity to participate in a four-day service-learning experience during school vacation. The session includes both classroom learning and hands-on service opportunities to immerse youth in education about the challenges facing Boston residents. February's theme is Youth-Serving-Youth, where participants will be volunteering to benefit youth in need. Contact: Ginelle Testa, generationOn Coordinator, Boston Cares, gtesta@bostoncares.org, 617.422.0910, Ext. 208 or email Ginelle at youth@bostoncares.org for applications and more information. Applications will be accepted until February 6. ARC Boston Food Pantry provides a five-day emergency supply of food once a month to low-income clients- about 105,0000 annually or 400-500 families per distribution day- making it one of the largest food pantries in New England. Volunteers assist by preparing 'wet' bags of perishable food, assisting clients with the intake process (multilingual skills are helpful), carrying food bags out of the pantry for clients to their cars, etc. Volunteers need to be able to lift 25 pounds, be able to stand for three or more hours, take direction willingly and to work comfortably in a diverse environment. In cold weather volunteers should dress warmly because work in and outside of the pantry can be very cold. Dress comfortably, but no cut off shorts, mini-skirts, half shirts, open-toed shoes or sandals. Do not bring any valuables or jewelry to your volunteer shift. Time Commitment: Shifts are for 3.75 hours but it is okay if volunteers need to leave early. Volunteer activities include greeting and signing-in blood donors, along with offering refreshments following blood donation. Time Commitment: Shifts run three to six hours and volunteers commit to a minimum of one shift/month. Contact: Raven Camara, Volunteer Recruitment Specialist: 617.274.5325 Please complete and submit the online volunteer application. Many children want to help animals on a farm. Younger kids can experience what it's really like to roll up their sleeves and get a little dirty on a farm - cleaning cages and mucking stalls! That's why MSPCA offers the Nevins Farm's "Family Service Day" series. Eleven times a year (most often on a Monday holiday), adult-child pairs are able to participate as hands-on volunteers at the MSPCA. Each group participates in three activities: an animal care chore, support chores, and an educational presentation that includes a fun activity and an animal meet and greet. Animal care chores include cleaning cat cages, walking gentle dogs, or mucking horse stalls. The program provides a fun and educational opportunity for families to make a meaningful contribution to the MSPCA's animal care efforts. Location: The MSPCA at Nevins Farm, 400 Broadway, Methuen. Does your son or daughter LOVE horses and farm animals? As little as $7 a month can make a difference in the life of a neglected horse...$7 can buy a bale of hay to help feed the dozens of horses, goats, sheep, cattle, and rabbits that are cared for every day at the MSPCA at Nevins Farm. Each year, the MSPCA at Nevins Farm's Equine & Farm Animal Center spends almost $60,000 on hay. You can help your child contribute by running a bake sale, encouraging them to use a portion of their allowance, or coming up with other creative ways to raise money to support this worthy cause! Stop Hunger Now is an international hunger relief agency that has been fulfilling its commitment to end hunger for more than 15 years. Since 1998, the organization has coordinated the distribution of food and other lifesaving aid to children and families in countries all over the world. The Stop Hunger Now meal-packaging program has perfected an assembly process that combines rice, soy, dehydrated vegetables and a flavoring mix including 23 essential vitamins and minerals into small meal packets. Each meal costs only 29 cents. The food stores easily, has a shelf life of two years and transports quickly. Stop Hunger Now works with international partners that ship and distribute the meals. You and your family can help by volunteering at this fun, meal-packaging event. You and your children can make pet toys to entertain and help animals feel more at home while they're living in shelters. The animal lovers in your family will enjoy the activity of sharing love and toys with lonely pets. 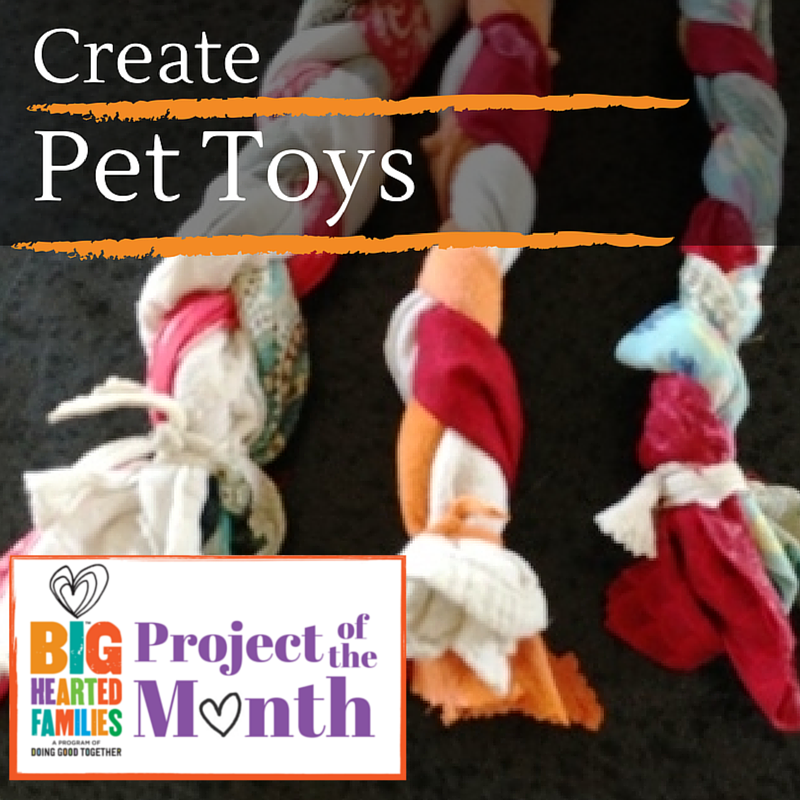 You can find lots of ideas at Doing Good Together's Create Pet Toys project page, including ideas for lots of different pet toy projects, reflection questions and other resources. DGT Boston is expanding! Given the overwhelming response we've had from volunteer families in the suburbs of Boston, we'll be listing opportunities throughout Middlesex County. Please pass on the word and recommend DGT to your friends! Can you pass this on to 10 families who you think would like to learn about family volunteering opportunities? Thank you!